What are the top five plants for attracting bees to a garden? I wish it were that simple, but it takes more than just a few key plants to really attract bees and other pollinators. Bees need food, water, shelter, and a place to raise their young. 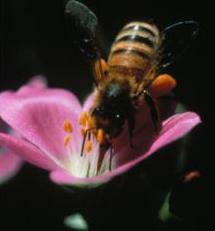 Flowers that provide nectar and pollen are the most attractive to bees. Gardens with 10 or more species of attractive plants will have the largest number of bees. It is important to plant flowers that bloom successively over the spring, summer, and fall seasons in order to provide pollen and nectar resources to the native bees of all seasons. Large swaths of one single plant type are the most attractive to bees because they do not mix pollen when foraging. Bees prefer blue and violet flowers, also yellow flowers which they see as blue. Most native bees are solitary nest makers and build their nests in the ground or in pre-existing cavities. Provide nesting blocks like the ones we showed you today, leave bundles of hollow sticks, and leave bare patches of soil or sand in your garden. Bees will not dig through mulch to nest. The links below provide plant lists sure to attract bees to your garden.